Each month, we ourselves must think a mini make crafts. Look what I made with buttons. Great little chair you made Lisette! You are so lucky to have a club. I wish I could have a miniatures club here! I think I am the only miniaturist in the whole of the middle east! What a terrific idea, your chair worked so well. Lisette,wat ben jij toch geniaal!!!!!!! Wat een goed idee van die leren knoop,om daar een krukje van te maken...super! Great idea:) I have tons of buttons!! I have uesed them as caps fot little containers with a bead on top as a lid. 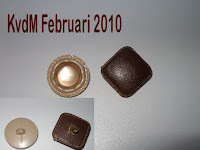 You can see it om my blog if you like. Wonderful!!! 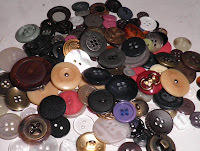 I have lots of buttons also--I will be looking at them with new eyes now! amazing what you can do with the buttons! genius is the idea of padded chair! but also the picture is very beautiful, congratulations! Wirklich schöne Teilchen. Klasse Idee. Great idea, and a lovely stool!! !